Salmon is a delicious protein with minimum waste. We eat it quite often so I always have some in the freezer. One of my favourite ways to cook salmon is to lightly spray a piece of foil, place it on a baking tray and place the salmon fillets on top. For two portions each weighing 180-200g, mix 2-4 teaspoons each of grated ginger and Thai sweet chilli sauce and spread it over the fish. I use 4 teaspoons, which is equivalent to a tablespoon, because we love ginger! Place in a hot oven at 200°C for 7-8 minutes, if you like your salmon medium-rare. Serve with a salad or green vegetable for a quick, delicious and healthy weekday dinner. 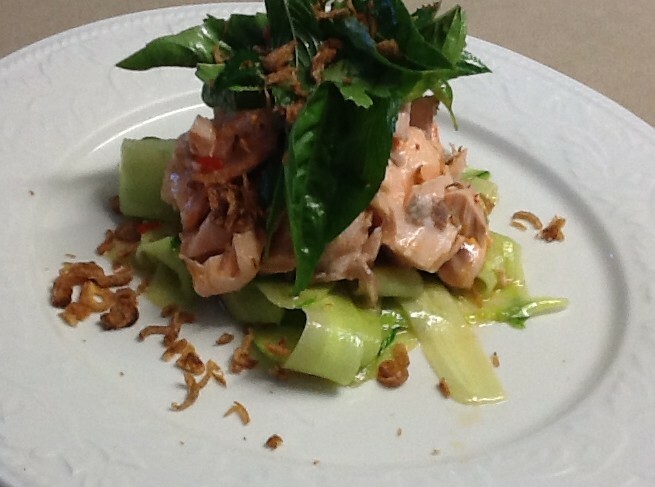 Adapted from one of chef Luke Mangan’s recipes, this Salmon and Cucumber with Asian Dressing takes a little longer to prepare, but it’s not complicated. If you halve the recipe use a very small omelette pan to poach the fish. Place poaching ingredients in a small shallow frying pan. Simmer for 5-10 minutes then add salmon, cover and switch off the heat. Leave to cool. Meanwhile make dressing by placing ingredients in a jar with a lid and shaking well. Peel cucumbers, then slice lengthwise with a wide vegetable peeler, going round and round removing the flesh in ribbons and discarding the middle when you get to the seeds. Place cucumber in a bowl and mix with some of the dressing. When salmon is cool enough to handle, remove from poaching liquid and break into large flakes, discarding skin, bones and the poaching liquid. Wash and dry herbs for salad – just the leaves. Recipe can be prepared ahead to this stage. Keep the individual components covered in the fridge till serving time. To serve: divide cucumber salad between four plates, forming into a round nest in the middle. Place salmon on top and spoon over some dressing. 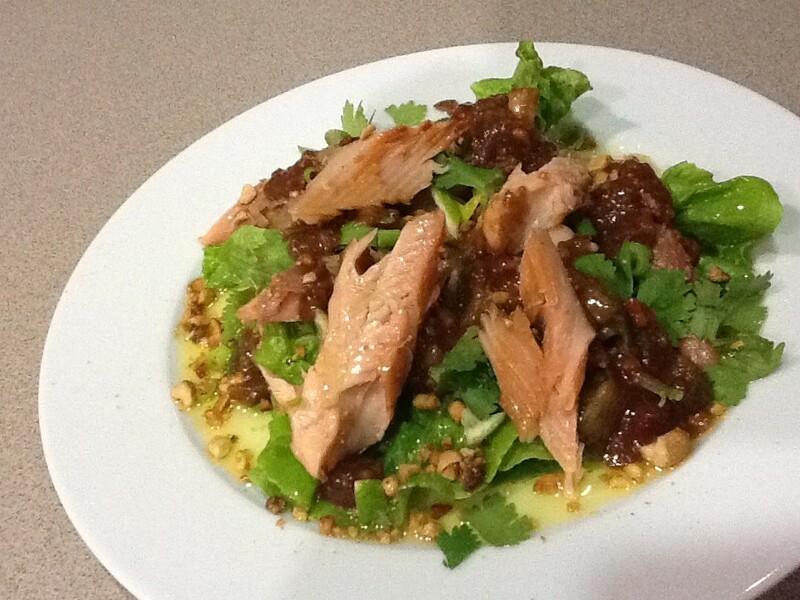 Mix herb salad with some of the dressing and arrange some on top of the salmon. Garnish with the shallots. 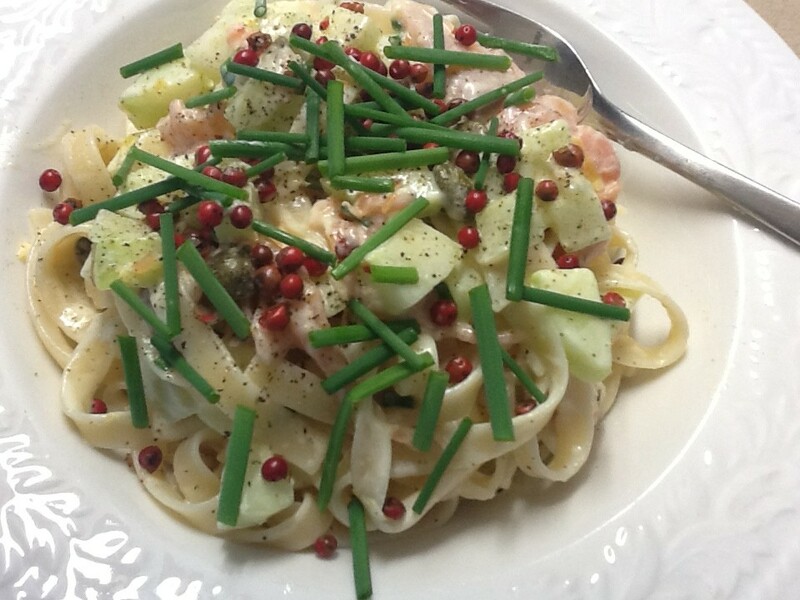 This entry was posted in Recipes and tagged dinner party, easy, quick, salmon, summer by Linda Peek. Bookmark the permalink. Where, oh where to get lemon grass in Chile?? Made the Salmon with Cucumber & Asian Dressing tonight, very tasty! Yes it’s a perfect dish for summer and quite filling.